There are several way to broadcast messages to your audience. 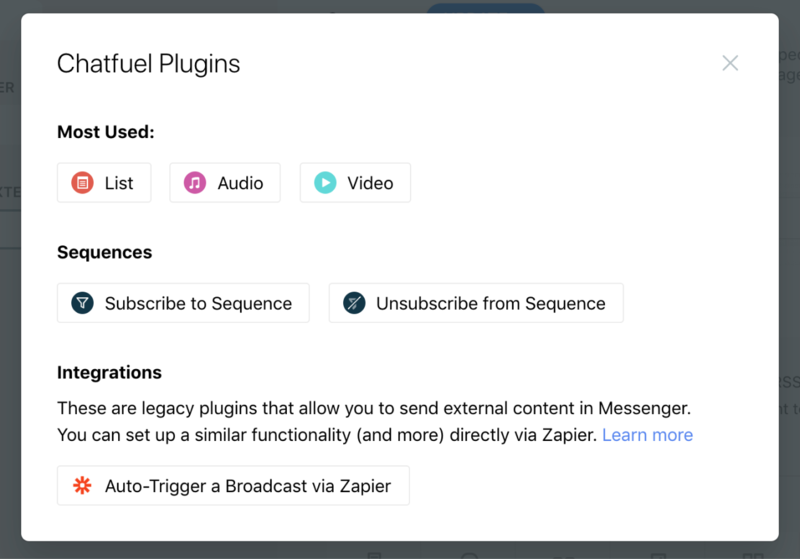 You can schedule your messages, autopost them from external sources, send your messages manually right away or send them as follow-up sequences – all of these can be found in the Broadcast tab in your Chatfuel dashboard. Activation button (‘Send’ or ‘Start’) is always at the top next to the title. Message Tag section is where you assign one of the predefined Facebook tags that define rules for message content, timing and frequency. 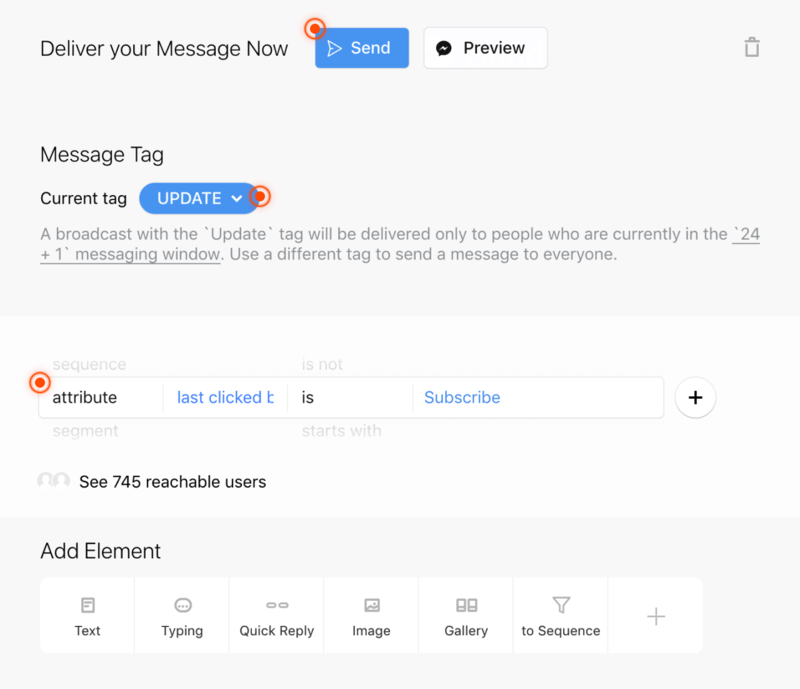 User Filter section allows you to narrow down recipients for a particular message, so that only certain groups of your audience will get the message. All broadcast messages fall into one of a few categories based on the content they contain. Facebook requires you tag each message based on its category, because different message types have different rules for timing and frequency. Promotional messages may only be sent within 24 hours of your bot’s last interaction with a particular subscriber, and must be tagged with Update. 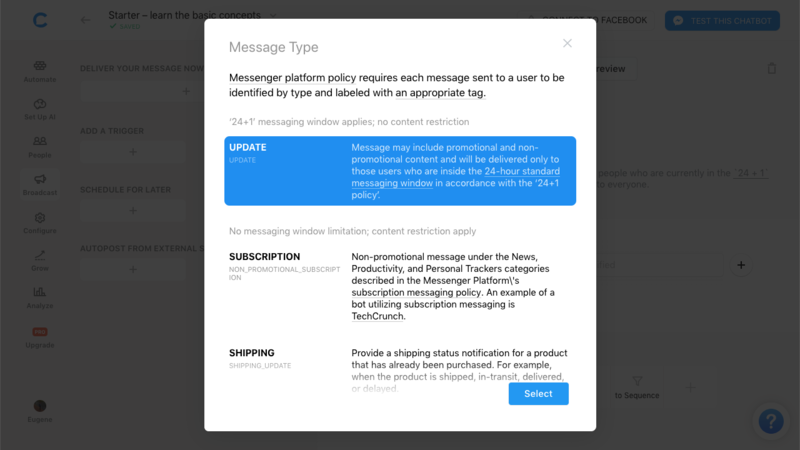 The only types of mass messages you’re allowed to send outside of this 24-hour window are those whose content fits under the Subscription tag or one of the Utility tags. Be warned, however: Improper tagging could result in getting banned from Facebook broadcasting altogether. By default, new broadcasts are labeled with Update tag. You can change it to another one by clicking on the current tag and read about the rest. 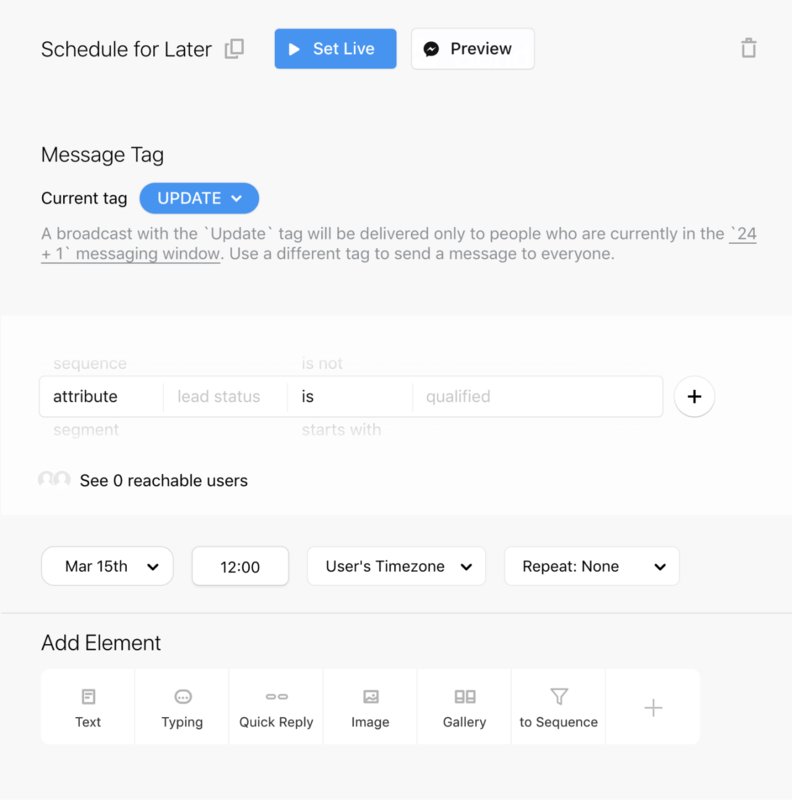 This feature allows you to instantly reach your users after you’ve composed a message for them, which comes in handy when you have an urgent update to share. make the broadcast recurrent by defining your preference in the Repeat dropdown menu. This feature allows you to select any external source – social network, some of Google services, RSS feed – and automatically send its content to your users as soon as the source updates. Note that for IFTTT and Zapier integrations, you’ll need to sign up for the services first.